Hey bike people! Come and join us for our annual Open House and Builder Showcase! 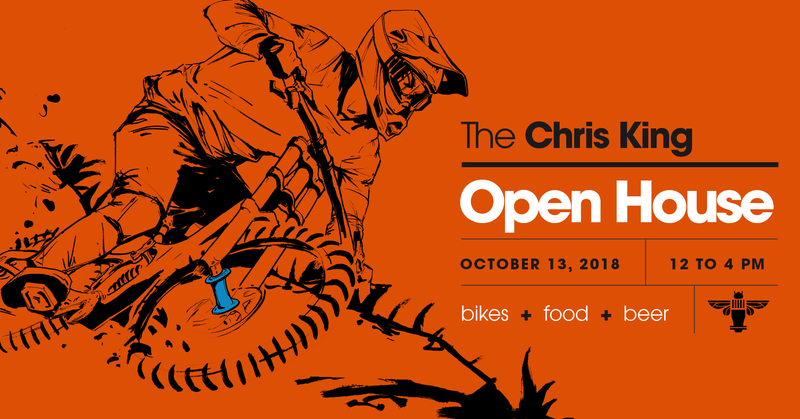 We’ll have food and drinks, and a plethora of custom bikes on display, all decked out in Chris King parts! This year we have EIGHTEEN custom frame builders displaying bikes that they’ve made exclusively for this event. If you are looking for a new ride this is you’re chance to talk to the builders face to face and get exclusive show discounts on your dream bike! We are also offering the chance to see where our parts are made on a rarely offered shop floor tour. These we’re extremely popular tours last year and will be even better this year! We have stepped it up and invited EIGHTEEN builders to make custom bikes for our 2018 Open House. The list includes Allied Cycle Works, Argonaut Cycles, Breadwinner Cycles, Caletti Cycles, Co-Motion Cycles, DeSalvo Custom Cycles, English Cycles LLC, Moots, Mosaic Cycles, Retrotec & Inglis Cycles, Sage Titanium Bicycles, Sklar Bikes, Speedvagen, Spooky Cycles, Stinner Frameworks, SyCip Bicycles, Ti Cycles Fabrication, and Black Cat! But wait, there’s more! We’ll have Santa Cruz Bicycles, ENVE Composites, Stages Cycling, QBP (Quality Bicycle Products), SimWorks USA, Smith, Fox Racing, and Alchemy Bicycle Company showing off their wares too! We hope you’ll come by and raise a glass with us and drool over some amazing bikes!